Ritze Perdana Service Residence is located at the heart of Damansara Perdana with beautiful resort style landscape and facilities like swimming pool, wading pool, BBQ areas, gymnasium, squash court, spa & sauna, multipurpose hall, reading lounge/meeting room and surau. Damansara Perdana is located within the Golden Triangle of Petaling Jaya, which also consists of Bandar Utama and Mutiara Damansara. This vicinity has consistently been voted by The Edge as the most sought-after address in the Klang Valley. Be it business, convenience, leisure or residential, this place is abundant of life with impressive accessibility via the LDP, SPRINT highway (Penchala Link), Persiaran Surian, and NKVE, renowned shopping and entertainment centres 1-Utama, IKEA, The Curve, Tesco and Cathay Cineleisure (to be opened for business soon), offices, hotels, schools, and much more. 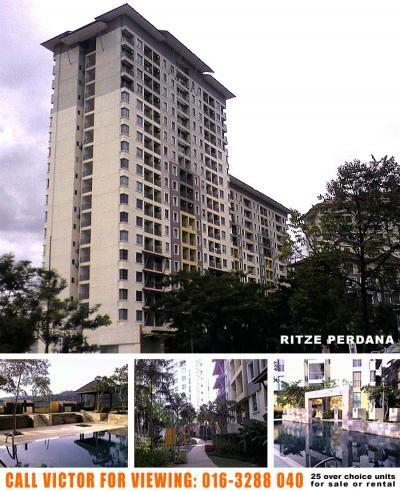 There are very limited units available for rental and sale at Ritze Perdana. Please feel free to contact me today for more information or viewing. Dear owners, I have a steady flow of clients to rent and buy units at Ritze Perdana and you are welcome to list your property with me. Still renting an unfurnished unit? Want to know how you can maximize your rental value at Ritze Perdana? Call me now and let me assist you in increasing your rental returns with minimum investment. Please feel free to contact me today for more information or to provide details of your property for sale/rent.